Wallets and accessories upcycled from used 6pack boxes. Announcement Everything you see is made and ready to ship. All cardboard is covered in clear vinyl to make these functional accessories durable! No leather used. Everything you see is made and ready to ship. All cardboard is covered in clear vinyl to make these functional accessories durable! No leather used. Got it fast. And it is so cute! Cant wait to show it off this weekend! Love, love, love this cute crossbody purse! So well constructed and allows me to show off my craft beer habit! These made a wonderful gift! Perfect! Birthday gift for my sister in law. They came out amazing! Fresh money clip/cardholders hit the shop this week. 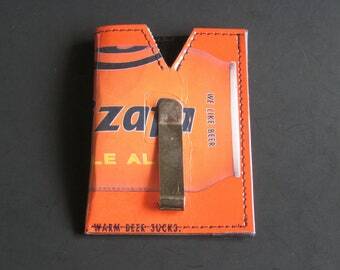 They make great front pocket wallets for the minimalist beer geek. My first craft space in 2011 before losing a room in my house to a newborn in 2013. Myself, modeling some beer gear in the early days. That one time I was in the Oregonian in 2011. I met John Foyston, writer of Beer Here, while at Portland U-Brew. Cascade Hops grown in my front planter. Johnny 5, my reason for everything. 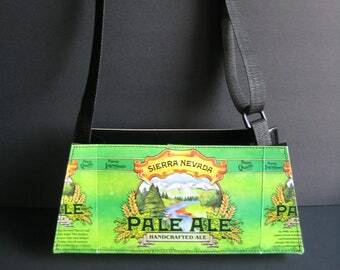 Wallets and other accessories made from used craft beer packaging. I am a full-time mom and I work during my son's nap each day. 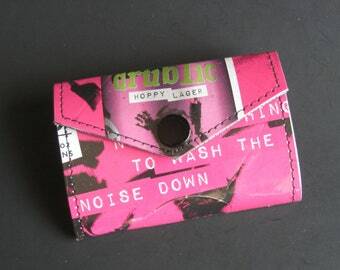 I started making wallets and other accessories out of craft beer 4-packs and 6-packs in 2010. 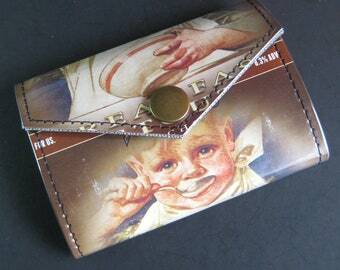 I designed my best-selling, bi-fold men's wallet in July of 2011. All patterns are my own, sketched down on notepads and graph paper. Everything you see in my shop was designed here first. I strive to make each piece completely functional and sturdy. At the same time, I wish to embrace the novelty of "upcycling" a used beer package. I do not intend my pieces to look like they were manufactured in mass quantities by machines. Remember, I hand-make every single piece you see in my shop. I want you to pull out your wallet and embrace all its blemishes. Every scuff, crease, or seam you see in the box material should be a reminder that someone (maybe it was you or maybe it was ME) who appreciates craft beer enjoyed every bottle that was kept in that six-pack box. It should bring back fond memories and make you thirsty for more. I'm right there with you as I put my heart into every piece of beer gear that emerges from my cutting table. Thank you for visiting my Etsy page. I am a lover of craft beer. I take the trash from my favorite breweries and make it into something one-of-a-kind. 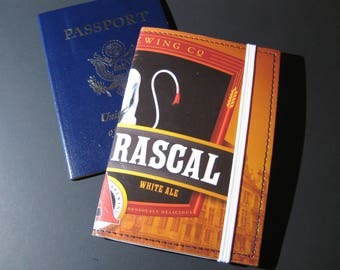 My goal is to bring a smile to your face every time you pull out our Gonzo wallet to pay for groceries or see your luggage come down the conveyor belt sporting an adorable SKA Brewing luggage tag. I also hope to bring more attention to my favorite breweries by creating a unique outlet of advertising for them. If my favorite breweries are doing well, they will continue to brew fabulous beer. Please contact me right away if there are any problems with your order. Your satisfaction is priority and I will do my best to make things right. Items may be returned and refunded within 14 days only if the item has not been used, worn, or damaged. A refund will not be honored on items if they are not in new condition. Refunds and exchanges on custom orders honored only if I made an error. If you wish to return an unwanted item you are responsible for the shipping fees. I accept credit card and PayPal. Nothing ships until payment is received. WA sales tax is added to WA sales. I do not require payment up front for custom orders. You pay when the item is ready. All items will ship within 24 hours after payment is received. Everything is shipped through USPS and most orders are shipped as First Class arriving in 3 business days. Please be mindful of what shipping address you give at the time of your order. Make sure Etsy and/or Paypal have your current and correct address. If you plan on being away from home when your item ships please make sure your mail is secure. I cannot be held responsible for lost or stolen items after delivery. In the event an item is lost in the mail or is being returned to sender, we must wait 30 days for that to clear up before I will refund or replace an order. I am happy to correct any error I make in shipping. You will contact me asking if I can create what you have in mind. I will say "yes I can make that" and I will look through my inventory of beer boxes to see if I have what you need. If I do not, I will suggest that you mail me a box from your favorite beer. I will make your custom item and notify you when it is ready and posted on Etsy. The item will have a hold for you in the title. You will then purchase your item like normal. Simple as that. It is very satisfying to do custom orders. I love to know that you have something unique and personal to you. I do offer wholesale pricing. I would love to get to know you brewery owners and make you some awesome gear. Beer people are the coolest. Send me a message and I'd be happy to get a few free samples out to you. Many of the boxes I use are from breweries I am in contact with and I have consent to use their boxes. I have such an overwhelmingly positive response from craft brewers that I assume, for the most part, that I am doing something good. If any of you craft breweries are not happy with what I am doing please let me know. I have no problem with you exercising your trademark rights and I will cooperate with your request to stop using your trash.